Jetstar Japan and Peach Aviation have received air traffic rights for China which, if utilised, would grow the Japanese LCC footprint in China – Japan's largest visitor source market. Spring Japan became the first Japanese LCC to serve China in Feb-2016. The absence of Japanese LCCs in China may seem surprising, but there are regulatory hurdles, market access questions and conservatism at Japanese LCCs. AirAsia Japan, launching in 2017, will likely leverage the group's China experience; it is the largest non-greater China airline group serving China. The prospect of further growth comes as incumbents cite overcapacity. What was once a profitable market now only produces returns in the peaks. All Nippon Airways, the largest airline between Japan and China, reported lower revenue on the back of "a deterioration in the supply-demand environment". Spring China has told Bloomberg that some competitors "aren't well-prepared", and will be "phased out". Overall Japanese LCC routes and capacity may be small but will be watched by Chinese airlines, ever mindful of the need to find new business models. The China-Japan market is already served by LCCs, including a Japanese LCC: Spring Airlines Japan. In Feb-2016 Spring Japan began services from Tokyo Narita to Wuhan and Chongqing. Spring Japan is a joint venture with Shanghai-based Spring Airlines. This is not to discount Spring Japan’s achievements in the China-Japan market: it is distant in management from Spring China and must navigate the complex and often conservative policies that Japan applies to its local airlines. Yet Spring Japan can draw on the Spring group’s extensive reach in China, including a local travel agency – Spring Travel. Spring Japan entering China was not easy, but easier than will be the case for Jetstar and Peach. Spring Japan can fly routes (mainly ex-Tokyo) that Spring China cannot gain Chinese route authority for, likely on protectionist grounds. Japan and China have an open skies agreement. Peach had planned relatively early in its life to serve China, but a deterioration in Japan-China government relations resulted in travel demand plummeting and the plans were stalled. Jetstar Japan can draw on some of the experience of the Jetstar Group in China, but Japan’s lengthy process for launching new international routes has added hurdles. Vanilla Air, Japan’s only other new LCC that does not have public plans to serve mainland China, has extra hurdles as it is new to the market. Although Vanilla might be able to draw on the experience of ANA (100% owner of Vanilla, and source of Vanilla management), ANA’s customer base was typically high yield Japanese business travellers or connecting traffic to North America. Vanilla will be aiming at point-to-point leisure demand, largely outbound China. This is consistent with Vanilla’s international passenger profile, mostly comprising foreigners, not Japanese. Japanese LCCs are faced with questions about how to work with agencies and tour groups and also how to help with visa facilitation. AirAsia Japan intends to commence service in Jan-2017 (it has filed schedules, however, only from Feb-2017). AirAsia Japan will surely enter mainland China faster than its peers (over four years for both Jetstar Japan and Peach). No doubt AirAsia’s inevitable entry was of some concern to Jetstar Japan and Peach, prompting them to move quickly. The AirAsia group is the largest LCC group in China by far. It is the second largest non-mainland Chinese airline group, based on available seats. The largest is Cathay Pacific, so AirAsia is the largest non-greater China group based on international capacity to mainland China. Such size does not come without experience and, most importantly, relations. Geographically, AirAsia Japan’s entry into mainland China will be different for the group as AirAsia Japan will be planning on the more northern Chinese cities that are within narrowbody range of Japan. Narrowbody range from the AirAsia group's base in Thailand (Bangkok, home to Thai AirAsia) has some overlap with narrowbody range from Japan. Narrowbody range from AirAsia's main Malaysian hub at Kuala Lumpur (south of Bangkok) only reaches southern China. Thai AirAsia's growing base at China Mai, north of Bangkok, reaches even further into China. Widebody flights from AirAsia X can reach northern Chinese points but the nature of the larger aircraft – 377 seats on an A330 – restricts AirAsia X to larger cities than those that AirAsia Japan, with approximately 180 seats on an A320, will be able to reach. Jetstar Japan: Tokyo-Shanghai, Tokyo-Guangzhou, Osaka-Shanghai and Osaka-Guangzhou. Peach's route applications appear relatively straightforward. Osaka is its main base, while Tokyo is a growing hub (and Japan's largest city). As CAPA noted in a Sep-2015 analysis, Shanghai is the largest Chinese city linked to Japan. 51% of available seats in the Japan-China market are to/from Shanghai. Beijing is second largest at a much smaller 16%. Over the past five years Shanghai has accounted for half of the capacity added to the China-Japan market. Between 2010 and 2015 Spring injected 88% as many seats into the Shanghai-Japan market as did China Eastern. Haneda, closer to the Tokyo city centre, is preferred for the local market and commands a yield premium compared with Narita. ANA maintained its Tokyo Narita-Guangzhou flight and added a Tokyo Haneda-Guangzhou flight. Jetstar Japan's Guangzhou services could give JAL a greater group presence than JAL has on its own. Jetstar Japan's lower costs could also be more appropriate for the lower-yielding Narita market. It is unclear how connecting traffic, if any, will take shape. Not only have the flights not been finalised or announced by the airlines, but no times have been given (and they might indicate connection viability). ANA and JAL's China-Haneda flights mostly cater to the local market whereas China-Narita is used to feed other international flights – mainly services to North America. Besides Jetstar Japan and JAL cooperating, Jetstar Japan has a codeshare with JAL's trans-Pacific JV partner American Airlines. The codeshare was announced before Jetstar Japan began international flying. There is potential for Jetstar Japan to provide lower-cost feed to the North American networks of partners. However, by doing this Jetstar Japan may trade off higher-yielding O&D passengers in order to accept a lower yield on transfer passengers. With JAL having only a minority stake in Jetstar Japan, the extent of partnerships may be limited, given this potential for conflicting interests. Guangzhou only has flights to Japan on China Southern, ANA and JAL. Guangzhou is unusual in having only one Chinese airline flying from a major city to Japan. Guangzhou has been shielded from competition, and the presence of LCCs. The potential entry into China of more Japanese LCCs fills a gap in their network. As in other countries, Japan tourism is becoming defined by the growth of China. The absence of Japanese LCCs may appear surprising, but is a combination of their relatively high costs (compared with Chinese competitors), regulatory complexities, and then their own conservatism. The entry of Japanese LCCs into China also means additional capacity and more concerns about overcapacity. The situation is short- to medium-term with long term prospects remaining bright. The challenge has come from the impact of large growth in a short period of time. Japan-China seat capacity grew approximately 60% between Jun-2014 and Jul-2016, according to OAG data. 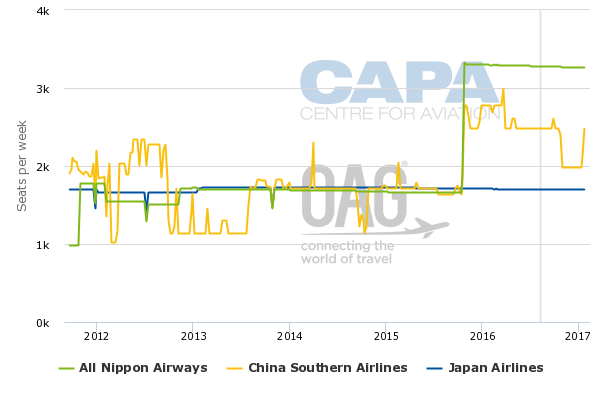 As CAPA has previously noted: 'Chinese visitors to Japan have doubled in 2015, and four new Chinese airlines launched Japanese service in 2014 and 2015. 34 Chinese cities have [had] service to Japan in 2015, up from 16 in 2010'. Spring Airlines Chairman Wang Zhenghua told Bloomberg in Jul-2016 that Spring's early entry caused other Chinese airlines to follow: “We made the first bucket of gold in this market and more have piled in after seeing that...Those who aren’t well-prepared will be phased out gradually and more rational and suitable players will stay”. All Nippon Airways is the largest airline by capacity between Japan and China (slightly larger than China Eastern). In its financial results for the first quarter (the three months to 30-Jun-2016) ANA made repeated references to Chinese overcapacity in China. ANA described "a deterioration in the supply-demand environment, principally for flights departing China", and observed a "demand gap on China routes" that ANA had to respond to with ticket discounting. China was one factor causing ANA's revenue to dip, although its full-year forecast remains unchanged. Japanese airlines, used to more conservative competitive conditions in local markets are losing their market grip, an uncomfortable situation as they seek to leverage China for connections to their growing North American markets. Japan was once a relatively small but very profitable market; but since the flurry of liberalisation, Japanese airlines have watched as Chinese airlines - with their considerably lower costs relative to Japan's full service airlines and their better China market reach - began to dominate. At the same time, Japanese visitors to China in 2015 declined to the levels of 2001. 2015 was the first time that there were more Chinese visitors to Japan than there were Japanese visitors to China. In 2014 53% of the China-Japan market was outbound Japanese. In 2015 it declined to 33% outbound Japanese. A few daily flights from the Japanese LCCs, even on trunk routes, will have only an incremental impact on market conditions – such is the large dimension of Japan-China traffic. No doubt fares will be further pressured. It is not difficult to extrapolate their impact and predict deeper changes as they – and Chinese LCCs – expand. This is occurring in another Northeast Asian short haul market, Japan-Korea, where LCCs have grown 1% market share in 2009 to 30% in 2015. Yet for the medium term the greatest impact from Japanese LCCs will be on Chinese airlines. Capacity impacts from Japanese LCCs may be relatively small, but Japanese LCCs serve as a reminder of more efficient business practices. This is even with the cost disadvantages that Japanese LCCs naturally come with, through being domiciled in an expensive country such as Japan. Chinese airlines know that they must change business direction: removing cost without necessarily becoming LCCs. Yet different levels of management and the government stand in the way. Chinese airlines often have the greatest fear – not of distant competitors or very close competitors, but instead competitors they do not fully understand. Jetstar Japan and Peach fulfil these worrisome characteristics: low cost airlines in a high cost economy with low growth. They will be watching with interest how, and to what extent, Japanese LCCs succeed.